If there is a single innovation worth saving from the wreck of modern history, it is the humble potato chip. This salty, savory delicacy, first popularized during the Industrial Revolution, is now a staple of the national diet: Americans individually eat an average of 4 pounds of chips per year, for an annual nationwide total of 1.5 billion pounds. To be honest, these figures sound a bit low to me. By a conservative estimate, I’d guess I’m eating at least 4 pounds of chips weekly. 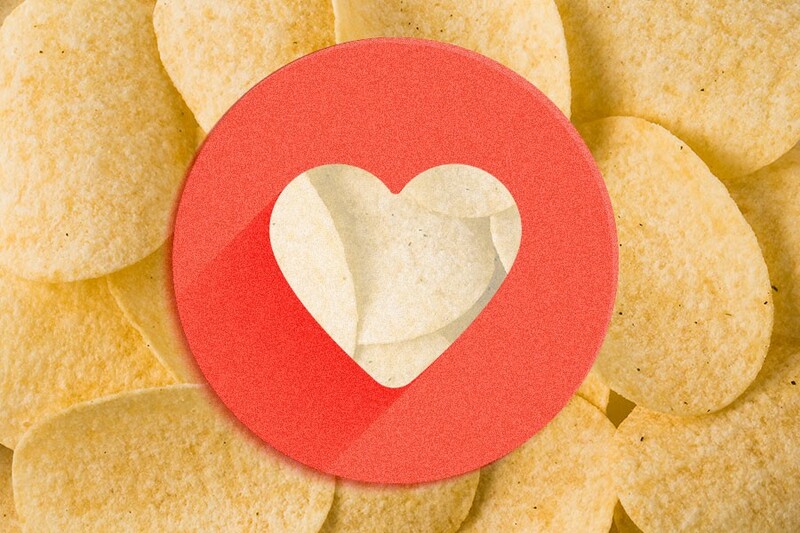 That’s not great news for my blood pressure — even if chips are the “healthiest unhealthy snack” — but it does make me an ideal member of “Gettin’ Chippy Wit It,” a private Facebook group that I often think of as the last bastion of decency and mutual respect left standing on the Internet. In the summer of 2016, writer Jason Diamond asked his friend network if there would be any interest in such a club; I and a few dozen others replied with enthusiasm, so he set it up. A year later, membership remains below 150, though by no means exclusive — you just have to know somebody who knows somebody, and you have to love potato chips. What happens on the chip page? People post photos of the chips they’re eating at that moment, or the chips they’re about to eat, or the chips they’re thinking about eating. They share their thoughts about said chips. Other members chime in with their own chip takes. Maybe that sounds basic and dull, but to skeptics, these chip-lovers would undoubtedly say: “No big deal. Have fun doing something else!” Here, it’s all chips 24/7. “I’m in groups for a few different food obsessions (Oreos, Seltzer), so joining a chips one was a no-brainer,” says chip enthusiast and Cambridge-based writer Kevin Fanning, one of the group’s earliest joiners. “The main benefit [of Gettin’ Chippy Wit It] is coverage — there are so many kinds of chips, new varieties being invented every week, and so many of them regional or hard to find. You’ll never be able to try all the chips, and attempting to eat all the chips would be gross. So hearing stories from around the world as people experience new chips is incredibly fun and rewarding and creates a lovely sense of community.” At the moment, he says, he’s currently working on fanfiction in which one character tells her friends about her secret chip group; he used the real page to crowdsource a favorite niche chip flavor for her, settling on Herr’s Old Bay. Diamond, the group’s founder and moderator, says it has vastly exceeded his expectations. “When I see people in real life who are in the group we always end up talking about how happy it makes us,” he says. “That blows my mind. Food brings people together. I’ve learned so much about friends and different places and cultures through food, and chips seem to be one of those rare foods that just about everybody likes.” Within chips’ universal, non-ideological appeal, he and others see a kind of antidote to the toxic or otherwise exhausting news cycles that dominate the web. Beyond their role as crunchy sustenance, chips can be an emotional life preserver — a known flavor when we’re caught in a swirl of uncertainty. Kristen Arnett, a writer and librarian who lives in Florida, posted about her formidable chip supply as Hurricane Irma approached the state. “I like the idea — always — of chips as this kind of beautiful comfort food in a time of crisis. They’re portable and preserved; they won’t go bad and don’t need to be refrigerated. I knew I could buy a bunch of them and leave them on the countertop. Knew that if I was freaked out or felt weird or scared I could eat them and probably feel better,” she says. “And that’s what I did — when the hurricane was bad, or when I was out of power afterward — I ate chips. Just me and my dog, happily snacking. It’s this very comfortable, good thing. Like no matter what bad thing is happening, even in the midst of a natural disaster, I can open a bag of chips and know it will taste good and like home. Know it’ll taste exactly, perfectly right.” No other treat or nibble, it would seem, can make a similar promise. But how has “Gettin’ Chippy Wit It” remained immune from the sectarian rancor that plagues almost every digital forum? (Even a page for Seinfeld memes has descended into an ugly flame war over matters of race and Nazism.) There are, to be sure, differences of opinion, as one must anticipate in any discussion of the more outlandish chips, including caviar- and haggis- and even Moscow mule-flavored novelties — yet they never escalate, as if people are content or actually curious to hear how others live out their passion for chips. “I’m in over 280 Facebook groups, and this is the only one that has remained pure and positive, no mod drama, no arguments about Trump, no off-topic garbage or people promoting their crappy [multi-level marketing schemes], just an enthusiastic community of fellow chip lovers,” says politics reporter Taylor Lorenz. The only plausible explanation is a self-reinforcing motivation to let our better angels take wing, which is odd given that the group largely consists of young media and publishing veterans, described by Helen Rosner as being “professionally cynical” elsewhere online. According to creative designer Scott Shields, “a certain level of respect and earnestness” is what keeps a page devoted to “a random shared interest” such a pleasure to read. “When I think of chips, I can’t help but think of a big plastic bowl at a party. It’s a focal point, a meeting place, and an icebreaker. At the party, whether you’re the wildest extrovert or the tiniest wallflower, there will always be someone hitting up the snacks,” he says, and Gettin’ Chippy has become the virtual equivalent. “It also gives me an excuse to pick up less than boring chips when I’m out picking up lunch,” he confides. I could go on — and many more Gettin’ Chippy disciples were eager to talk about their love of crispy fried potato slices, not to mention the numberless related treats like Cheetos and pretzels and Goldfish crackers — but I think you get the idea. If we didn’t have jobs, we’d probably be walking around door-to-door, asking strangers if they’ve “heard the good news about chips.” Speaking for myself, as a guy with the palate of a 11-year-old, I can say that nowhere else do I feel like a connoisseur, someone whose tastes are valued and engaged. It’s a little thing, we all agree, with a rather large impact. Not unlike a bag of Sweet Maui Onion kettle chips when you have to skip lunch that day.